British police have arrested a man suspected of trying to steal a Magna Carta from its display case at Salisbury Cathedral. 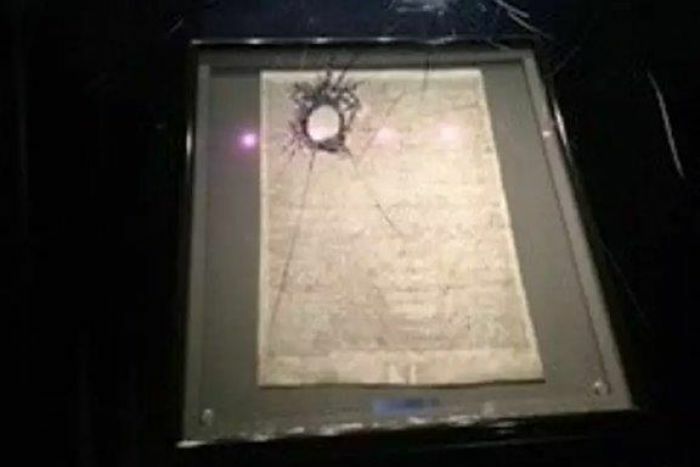 Wiltshire Police said cathedral alarms sounded just before 5:00pm (local time) on Thursday when a person tried to smash the glass box surrounding the Magna Carta. The Magna Carta granted by King John in 1215 has become an enduring symbol of the rule of law. The document on display at the cathedral is one of four surviving original Magna Cartas. Police say the Magna Carta was not damaged and no-one was hurt during the incident. A cathedral spokeswoman confirmed the attempted theft, and said the cathedral aimed to have the historic document back on display soon, the BBC reported. “We are very grateful to all who dealt with the situation so swiftly and effectively,” she said. The suspect, 45, was arrested on suspicion of attempted theft, possession of an offensive weapon and criminal damage. He has not been identified or charged. Police say the man matched a description given by witnesses. Salisbury Cathedral has been in the news recently because two Russians accused of carrying out the nerve agent attack on ex-spy Sergei and Yulia Skripal claimed during a TV interview in September that they had travelled to Salisbury to see its “famous cathedral,” not to poison anyone.